New exhibit technology allows guests to "Be the Astronaut"
“Be the Astronaut” is an innovative first-person experience for all ages that teaches science and engineering content via a fusion of physical exhibitry, state-of-the-art video game technology, simulators, and actual NASA reconnaissance data. Described as one of 12 must-see exhibits in the country by USA Today, the new exhibit came to Reno by way of Space Center Houston and is now available only at the San Diego Air and Space Museum, the Columbus Science Center and the National Automobile Museum. “We are absolutely thrilled to be the official home for this world-class project,” said Jackie Frady, president and executive director of the National Automobile Museum. 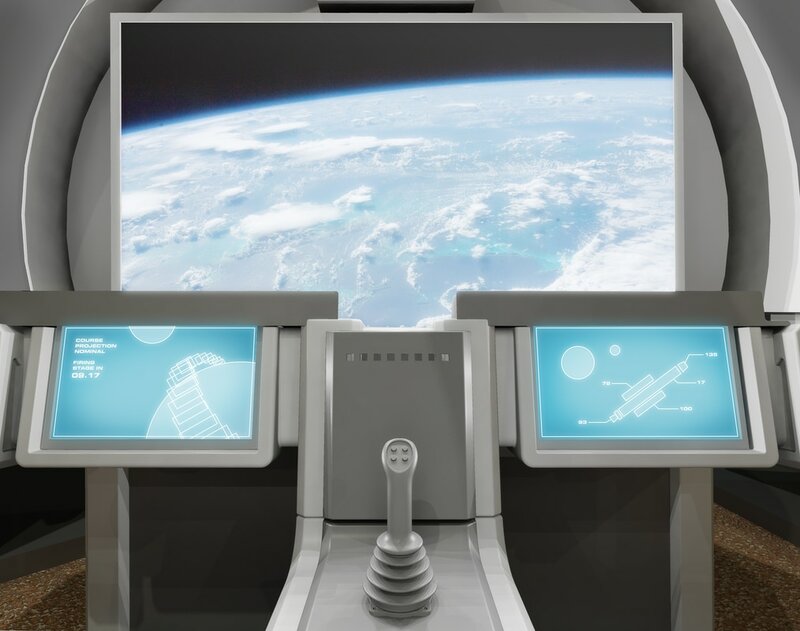 Scientifically verified by experts at NASA for accuracy and feasibility, this new interactive experience teaches visitors about the concepts, challenges, and excitement of spaceflight through the use of touch-screen stations, artifacts, and interactive simulator pods built to look like space capsules. Visitors have the opportunity to command a crew of virtual content experts throughout each stage of the exhibit. These digital experts help visitors learn what’s needed to fly a spaceship, pilot a lander, and drive a surface rover — and they appear onscreen as visitors climb into the simulators to perform these feats, in an exciting narrative adventure that spans the solar system. Each space capsule contains a large flat-screen monitor which serves as the ship’s “windshield,” giving visitors a first-person view of their adventures. Touch screens and industrial-quality joysticks put visitors in command. During missions, the cockpit comes alive with visuals and sounds that help visitors imagine what it's like to be an astronaut — training and carrying out their missions. Visitors receive a magnetic swipe ID card — their Astronaut ID/Rover Driver License— that they use to progress through each step of the exhibit’s missions. Also on display are space suit replicas, artifacts from NASA, and space memorabilia from American pop culture. Included are objects connecting NASA with Star Trek, Star Wars and even Snoopy — as well as the NASA-engineered life support module designed to fly mice to the Moon on the final Apollo mission. Eureka Exhibits, the producer of the award-winning exhibition, has a Space Act Agreement with NASA and is working with the Nevada Space Center and the National Automobile Museum to develop additional experiences. Some of these are featured on Science Saturdays at the Museum, monthly science-based adventures for all ages. The Nevada Space Center also hosts NASA subject matter experts, scientists, and astronauts. When the Russians wanted to explore the Moon in the 1960s, they built and sent the first rover. America sent humans. But to go further and faster, we built a rover. And we've been doing it ever since. Now a fleet of small "cars on Mars" have been deployed on the Red Planet. Come discover with us the past, present and future of Rovers! Don't miss this amazing film! Screening only in exclusive venues like the Smithsonian, the Museum of Flight, the California Science Center—and here! As a special feature of our "Rovers" Exhibit and with Challenger Missions, request this film for your group! Contact us to reserve a screening! Showcasing some of the most amazing vehicles in the world, the National Automobile Museum is now also introducing visitors to "ROVERS." Come and experience the past, the present and the future of Space Exploration! Keep up with all the exciting opportunities. Subscribe today!